Konark the Sun temple located at a distance of 65 Km from Bhubaneswar. 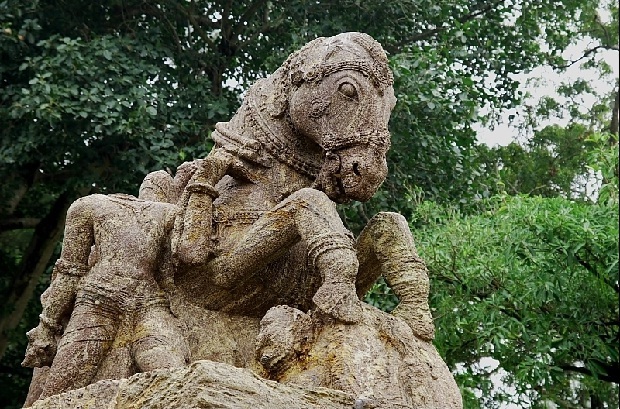 This temple was built by Narasimhadeva-I in C.AD 1250. Shaped like a chariot driven by seven horses on a 12 pair wheels. Mighty simha-gajas ( Lion and elephant ) welcome the visitors at the entrance. The walls of the temple contain superb carving of divine, semi divine, human and animal figures amidst floral and geometric ornamentation. Out of the total complex only the main entrance hall known as Mukhasala is only remains of the temple as a testimony to the glorious beauty of Orissa craftsmanship. The height of this Mukhasala is 45.7 m. There are four doors but all of them are closed and the temple is filled with sand and stone packing materials to prevent falling of stones. There is a pair of war elephant at the entrance of this Naata Mandir. At the top platform there are three opening sections designed to allow sun rays to fall straight into. They are designed keeping in mind the different position of the sun in different seasons. There is no roof for this Hall of Dance. Some historians say that the roof has collapsed. One casual visitor can spend one hour here and if you are interested in knowing all the details of temple and a art lover then you can spend more time. Official guides are available and they will take not more than one hour to explain you about the temple. Local guides can speak Hindi, English, and Bengali besides local language Oriya. Charges varies but we could manage for Rupees 25. As it is an open complex , take an umbrella or sun creams if required. You can get beautiful patching close design umbrella for rent at a cost of Rs 5 at the entrance of the temple. It is nice to take photographs with these colorful umbrellas. This temple complex is open for visitors from Sunrise to Sunset. Entrance fee is Rs 35 for Indian tourist and it is US $5 or Rupees 250 for foreign tourist. Entry is free for children below the age of 15 years. One can carry a normal still (not video) camera free of cost. Rupees 25 is charged for carrying a video camera inside the complex for a day. There is a restriction of carrying or using stand for taking photographs. Photography climbing upon sculptures and architectural part is prohibited. There is a sea beach ChandraBhaga beach at a distance of 3 Km from Sun temple Konark towards Puri. This beach is not safe for taking bath or boating. Without the help of local fisherman ( Nolias ) it is dangerous to enter into the sea here. Sunrise can be observed from here. 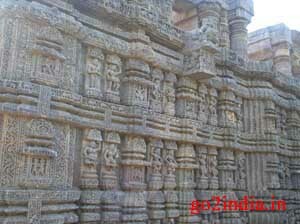 One can stay at any place out of Bhubaneswar, Puri and Konark and can visit other two places. Usually visitors starts from Bhubaneswar and covers Puri and Konark in a day. 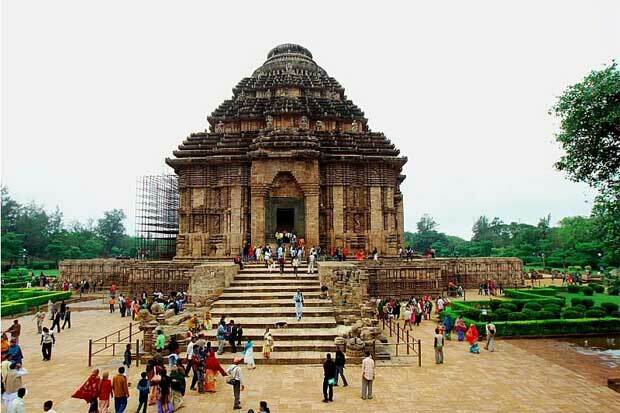 But if you don't want to stay in crowded places like Puri or Bhubaneswar then Konark is the best place. 12 noon checkout time. This hotel has a restaurant inside its complex. This hotel is best if you are interested to stay close to sun temple. 12 noon checkout time. Sun temple is walk able distance from here and this hotel has a conference room and a restaurant. There are some more private lodges available around this small town.